Pete Seeger died on Monday night in Manhattan. He was 94 years old. The impact and influence of the legendary face of folk music and cultural issues is difficult to quantify, but the sheer size of any timeline of his life begins to tell the story. Standing at the fore of folk music throughout the middle of the 20th century, Seeger spent decades not only popularizing the genre, but also using it to push for massive social change. He was even blacklisted amidst the rampant paranoia of the McCarthy era for his efforts. Tributes quickly began spilling out. Musicians, politicians, and many more have come together to laud him, from Bruce Springsteen to Andrew W.K., and from Bill Clinton to Bill de Blasio. Justice, truth, and beauty. Inspirational, generous, and passionate. These are just a small sample of the words used by people who are themselves legends and icons in the world. 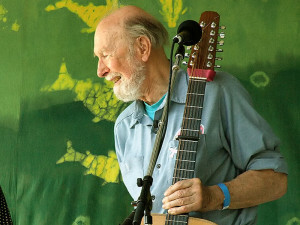 Peace, civil rights, labor rights, climate change, the occupy movement, the outlawing of the death penalty – Seeger used his medium, and his fame within that medium, to champion causes throughout his blessedly lengthy life. “We Shall Overcome,” “Where Have All The Flowers Gone?,” and “If I Had A Hammer” will long outlive the man who sang them, and through them he’ll be remembered. The lasting of his legacy speaks to the man’s work. More than six decades after he first emerged with The Almanac Singers in the ’40s and The Weavers in the ’50s, Seeger was still an avid and active performer and social justice promoter. Right up until his last year, Seeger was still performing, marching in the Occupy movement, appearing on the Colbert Report, releasing an audiobook, and much more. Without Pete Seeger, the world would not be as it is today. The people he touched are like sand on the beach in their incalculability. This is a man who did it all. He was a music teacher during his blacklisted years. He hosted a 60’s television show, Rainbow Quest, that had guests like Johnny Cash and June Carter, and he was a board member of the Newport Folk Festival. He made waves both in classic folk groups and on stages solo. Pete Seeger was a man who believed wholly and completely in the power of music. In these past 24 hours, I’d like to think that the whole of the music world showed that it picked up on at least a few of the things he tried to teach us.